You are currently browsing the tag archive for the ‘drunkenness’ tag. 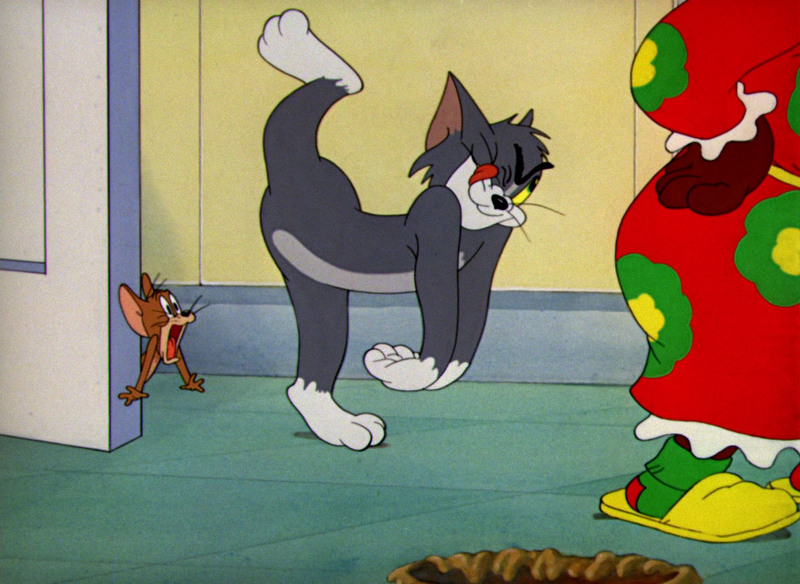 ‘Naughty But Mice’ introduces Chuck Jones’s very first regular cartoon star, the infamous mouse Sniffles. Sniffles’ first appearance immediately explains his name, for he has a cold, and visits a drug store for medicine. He finds one with a lot of alcohol, and is drunk almost immediately. Then follows a rather curious scene in which Sniffles talks and even sings with a humanized electric razor, in an all too slow scene. After this strange scene the second act starts, in which Sniffles is threatened by a cat, and rescued by the razor. Like many of Jones’s earliest cartoons, ‘Naughty But Mice’ is a clear attempt to emulate Walt Disney. 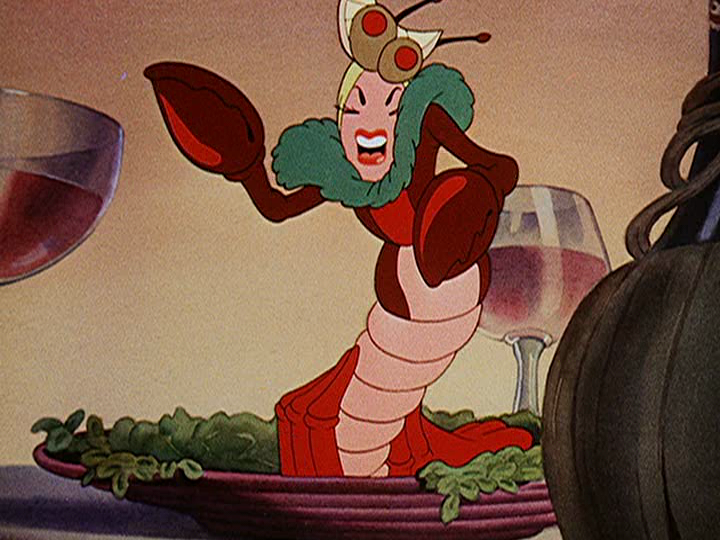 Sniffles even vaguely resembles the country mouse from ‘The Country Cousin‘ (1936), which also gets drunk. The result is a slow and cute cartoon. The short is saved, however, by gorgeous art deco-inspired background paintings and by Carl Stalling’s beautiful score. Sniffles is far from an interesting character, and out of league with Daffy or even Porky. Nevertheless, the little mouse would star ten more cartoons, lasting even until 1946. Among the earliest 24 Silly Symphonies there’s a remarkable lot of dancing, as the novelty of movement to synchronized sound formed the basis of the series’ initial existence. ‘The Merry Dwarfs’ is characteristic of these earliest Silly Symphonies. It opens with dwarfs working to the music of Giuseppe Verdi’s anvil chorus from ‘Il trovatore’. Soon we watch them drinking beer (quite remarkable for a cartoon made in the age of abolition) before the long dance sequence kicks in. This tiresome dance sequence first involves four dwarfs, then two. True, the gags follow each other remarkably naturally, but the dance remains rather dull anyhow until the very end. The cartoon’s sole highlight is in the end, when the two dwarfs fall into a barrel of beer, and their drunkenness makes everything, including the background, wobbly. There is very little to enjoy in ‘The Merry Dwarfs’, but as it involves dwarfs, it is nice to watch it together with ‘Babes in the Woods‘ (1932) and ‘Snow White and the Seven Dwarfs’ (1937), and gasp at the enormous strides the Disney studio had taken in a mere eight years. A young man on a motorcycle is on his way to his girl. Along the way he stops at a bar, where a wedding is taking place. There he’s offered a drink, which he reluctantly accepts. However, one leads to another and he is quite intoxicated when leaving the bar. Driving at night he tries to speed against a car, a train and even a plane, but he finally crashes, never to see his girl. This educational film warns us not to combine drinking with driving. In this respect the film is very dull and predictable, but Trnka’s illusion of speed and drunkenness is astonishing. Mammy threatens Tom he goes out if he doesn’t catch ‘that mouse’. In the chase Tom accidentally gets drunk, which changes him into Jerry’s best pal and rebellious against Mammy. This can’t go well, and in the end we see Mammy chasing a hiccuping Tom in a moonlit landscape. 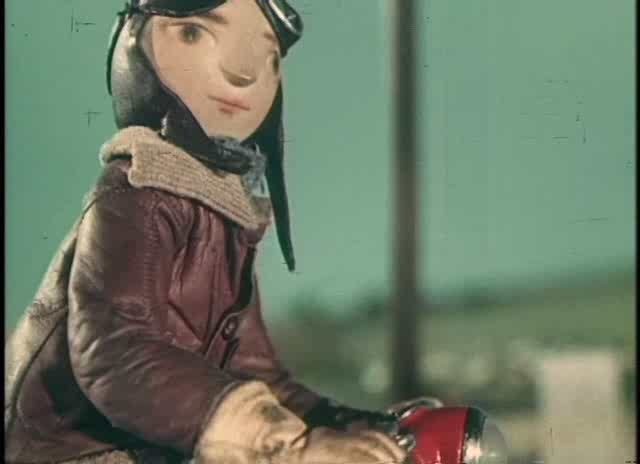 The animation of the drunken Tom is very well done and a delight to watch. However, somehow, ‘Part Time Pal’ also seems to be the most inspirational cartoon to the Czech studio Gene Deitch led for his Tom and Jerry cartoons (1961-1962), because Tom’s design in this cartoon is remarkably similar to those later, way more poorly animated cartoons.